Underskog (directly translated from Norwegian meaning “undergrowth” or “underwoods”) is a phenomenon I heard about even before moving to Oslo. Sometime in 2008, my Norwegian friend, being only too happy about being a part of it all, described with almost indecent enthusiasm a closed Internet community one can access by invite only. Facebook was becoming mainstream, Twitter was getting over 4 million users; the social platforms were no longer you and me (e-mail) or the universe and me (chatrooms) — it was you and me and everyone we know. The creators of Underskog.no describe it as “A website for people who are interested in the underground of Norwegian culture and can help each other find information that is worth checking out.” The aim is to gather people who are interested or involved in art, music, literature, etc, and who are willing to contribute with discussions, events and information about non mainstream cultural happenings in the biggest Norwegian cities. The initial idea of the creators was to make a list of niche culture events for their friends, and later a small community to update. In 2004, the founding members gathered a small number of friends and got started. To begin with it was open to all, but used only by the founders’ extended group of friends. Today we count about 28 000 foresters (registered members), but it’s hard to know how many of them are active users. 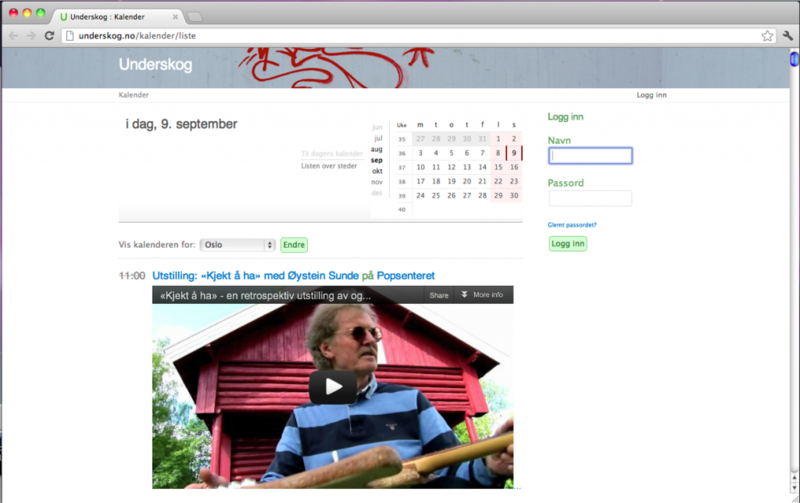 Underskog is now mainly two things: the non-member user can access a daily calendar of happenings and events, while a registered member can access the forums and update the calendar. One becomes a member after being invited, and only the most active members have invites to distribute. On the forum, there are conversations within a wide range of topics; from political discussions and DIY-tutorials to (badly) disguised online dating. It’s a standing joke that the currency of Underskog is Macbook chargers or red wine (note: the value of red wine increases after 8 p.m, when it’s not legal to buy alcohol in Norway). One of the two can get you pretty far since trading is a common practice among the users. Contribution is a key word, and essentially what runs the site. The moderators — called “gardeners” — interfere as little as possible. And there is rarely a need for them either; bad behavior such as trolling, whining or out-of-scale self promotion will result in public lynching, courtesy of the other members. The creators admit it themselves in a text intended to policy makers: ”Today’s culture of Underskog is so established that there is no longer any reason for us to play policemen or officials. The culture is robust and self-regulating; for the gardeners it’s enough just being a little observant and otherwise enjoy ourselves with using the service as ordinary members.” There is a strong sense of correct etiquette. For a fresh member, the rights and wrongs of Underskog can seem a bit confusing — perhaps even intimidating. But in my opinion, what distinguish Underskog from other social platforms is — for lack of a better word — how nice people are to one another. If you ask for help, you will receive. In comparison, you would get any help from strangers on Twitter without having thousands of followers. People will help you when you are in search of information, when you need help with moving, or if you’re just after the name of the cute girl you saw last Saturday but never dared talking to. Underskog is organized like a forum where the threads are ordered by date of creation. Nevertheless, thanks to a system of starring to follow conversation, some threads go through the years: the conversation “trashbildetråden!” (directly translated by “trashy pictures-thread”) was created in 2008 but is still fed with daily posts and counts a total of almost 28 000 messages. One of the characteristics of Underskog is how attached and devoted the members are to the page. I think there are different reasons behind this relationship, and we have to look at the regulations of the website to understand it. Andrew Morrison, Even Westvang and Simen Svale Skogsrud noted in Whisperings in the Undergrowth: Communication Design, Online Social Networking and Discursive Performativity (2010) that “knowing that everyone can see who you know and may connect them to real life persons adds gravity to the act of uttering”. This tolerance/peace, which — let’s be frank — is not a tradition in online communities, is no doubt a strength of Underskog. Howard Rheingold wrote about the viritual community The WELL that people were “rediscover[ing] the power of cooperation, turning cooperation into a game, a way of life” (in Where the Counterculture Met the New Economy, Fred Turner, 2005). The exact same thing is happening on Underskog, decades later. Underskog somehow belongs to its users. They decide who is going to join the community, they give feedback about design and other changes, and they feel like it matters. They keep the site alive; the users are Underskog.